Stone Design by Santos is serving in the Florida region for past many years. We are in the bathroom and kitchen remodeling and giving it a modern look. Our professional’s work according to requirements given by the customers. We deal in granites, natural stones, quartz, onyx and marble for building the countertops over the bathroom vanities. The clients can renovate their bathroom by taking the services related to bathroom vanities Fort Lauderdale. We offer the customized bathroom vanities services at competent and affordable prices. Our company believes that as soon as our clients step into their bathroom, they must feel relaxed and refresh with the modern vanities. 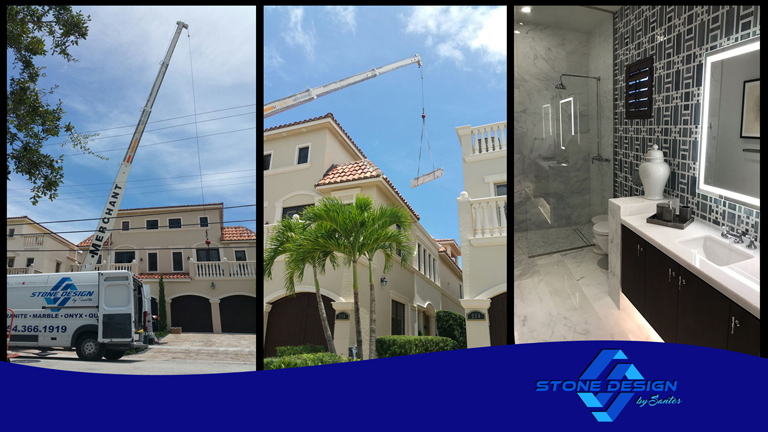 Stone Design by Santos provides bathroom vanities Fort Lauderdale attached with the faucets, fixtures, cabinets, lights, and showers. Moreover, the granite, quartz or semi-precious stones designed bathroom countertops will add elegance to the customer’s home. We provide the best-featured accessories and people living in and around the regions of Florida take our service because of our unique and outstanding material quality. We also possess a great fabrication unit that customizes the vanities with the use of latest technology. The skilled technicians have necessary certification and possess a detailed expertise of the modern interior designs. Even our supervising and vanity installation team is quick and accomplishes the work within the stipulated time. We extend superior quality services by providing the stones of different textures and colors. Hire Us for Your Next Bathroom Project! Stone Design by Santos believes in rendering 100% customer satisfaction without any kind of delay in the work. Our experts will guide you through each step and will tell what material will suit best for the bathroom vanities. Another important advice is related to the sizes, designs, shades, fixtures, and faucets. We also provide the complete bathroom vanities Fort Lauderdale package to our clients with relative services. Here are few pointers to choose us for your next bathroom project. If you are looking forward to amazing bathroom vanity Fort Lauderdale work for your home, then look no further and reach out to us through santoshomegranite@live.com today.